As a Administrator we have to know Linux boot process which help us to troubleshoot if Linux server struck up in booting. In new version of Linux like RHEL 7 / Centos 7 / Fedora 24 Linux Boot process made very faster compare to old versions. New version of Linux includes systemd which is replacement for Init. Systemd is introduced as a first modification still it support init scripts as backward compatibility symbolic link from /sbin/init –> /usr/lib/systemd/systemd. When you press on power on button SMPS (switch mode power supply) will get an signal to power on, immediate after it PGS (Power on boot signal) will execute to get power to all components. (Power-on-Self-Test) is diagnostic testing sequence all the computer parts will diagnose there own. 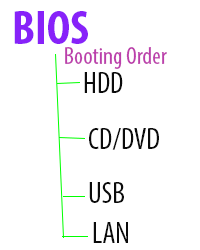 Based on device order BIOS will first boot device, in this case we are considering as HDD as first boot device. Boot loader – contains boot loader program which is 446 bytes in size. (Grand Unified Boot Loader) configuration file located in /boot/grub2/grub.cfg which actually points to initramfs is initial RAM disk, initial root file system will be mounted before real root file system. Basically initramfs will load block device drivers such as SATA, RAID .. Etc. 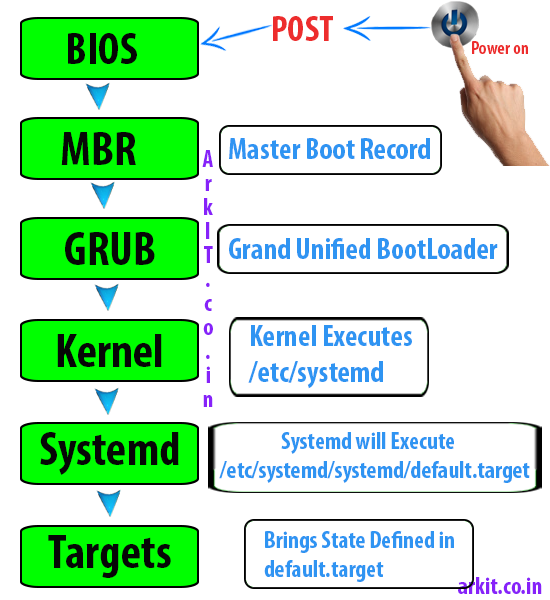 The initramfs is bound to the kernel and the kernel mounts this initramfs as part of a two-stage boot process. GRUB2 config file will invoke boot menu when boot is processed, kernel will load. When kernel loading completes it immediately look forward to start processes / Services. After that, the systemd process takes over to initialize the system and start all the system services. How systemd will start. As we know before systemd there is no process / service exists. Systemd will be started by a system call fork( ); fork system call have an option to specify PID, that why systemd always hold PID 1. As there is no sequence to start processes / Services, based on default.target will start. If lot many services enabled in default.target boot process will become slow. Once that’s done, the “Wants” entry tells systemd to start the display-manager.service service (/etc/systemd/system/display-manager.service), which runs the GNOME display manager. Your User interface start and prompt you for credential to login. Please do comment your feedback which is more important to us. very useful stuff explained in understandable format. Hi Ram, As of now we did not have any recorded videos for sale, soon we are going to publish on Youtube. Stay tune. Thanks.